"A well-rendered Western scene by a very important American artist." "A humorous pair of American naive folk art paintings of a dog, cat and rooster." "A superb bronze art deco casting in an African motif." "A wonderful Southern image by an accomplished artist." "A very colorful and beautifully framed work by an accomplished American artist." "A pair of beautifully framed abstract paintings by a well listed American artist." "A wonderful post-impressionist painting of a European scene by an American artist." "A very cheerful American art deco painting." "A very pleasant post-impressionist painting." "A rare and well-rendered modernist/art deco painting by a well-listed Tennessee artist." "An extraordinary naive painting from the 1930's - 40's documenting the performance of an icon of popular culture from that period." "An exhibition size seascape painting by a very accomplished American artist." "A rare and very interesting early 20th century painting of a famous Pittsburgh bridge under construction." 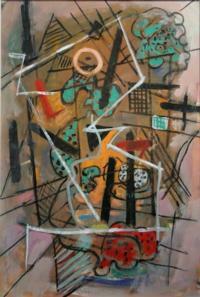 "A wonderful modernist painting from the 1940's by a well-listed American artist." "A beautiful French impressionist painting by an accomplished French artist." "An unusual and exceptional painting by a master of the American Regionalist period." "A very interesting large folk art rendering with Native Americans." "An extraordinary painting and a wonderful modernist interpretation of Pre-Raphaelite works." "Arguably the best painting rendered by Costigan." "The artist's reputation became inextricably linked to Southern subjects." "A rendering of a Tennessee historical site, which no longer exists, by a very interesting 20th century Nashville character, political figure, and artist." "PASTORAL LANDSCAPE by Edward Gay, N. A. A beautiful painting in the Barbizon tradition; an impressively sized canvas by a noted American painter. A large & impressive work depicting a pastoral coastal scene. "Quality early Florida paintings are quite rare." "An Ashcan School painting by an important American artist that exhibited at the seminal International Exhibition of Modern Art (The Armory Show), 1913, New York City." An excellent rendering by the artist. Probably Strauser's wife, a rare early work by the artist. "A wonderful academic rendering in the manner of the ashcan school artists." "A beautiful rendering by an important artist who, during his lifetime, became one of the best-known American landscape painters." "An exceptional impressionist painting from the early 20th century by an important American artist." "Occasionally Smith pictured genre scenes, such as 'Treme Market, New Orleans,' 1890...."
"A very interesting modernist painting by a very accomplished American artist." An intensely colored, evocative watercolor. A beautiful 19th Century watercolor painting in pristine condition. "An important rendering related to the Great Depression era." "An interesting painting by a Chicago artist who studied at the Art Insititute of Chicago and who is known for her abstract paintings." "A very pleasing 'modernist' painting by an artist who was very active during the 1940's." An interesting small painting by an accomplished artist. "An interesting rendering by a talented artist." "A well-rendered small painting by an important American artist." "A very interesting arts and crafts painting in the original arts and crafts frame." "A beautiful and well-rendered work by an accomplished American artist." "A very pleasing Vermont scene by one of the most renowned New England painters." "A beautiful post-impressionist painting by an Indiana artist who studied in Paris and Munich." "A large and very beautiful rendering of the snow covered mountains of Vermont." "WOMAN WITH PARASOL by Ernest Roth, N.A. An impressionist painting of the famed Luxembourg Gardens. "A very well rendered painting by a Louisville, Kentucky artist." "An exceptional small post-impressionist painting in a gold leaf frame." "An interesting small painting in a gold leaf, finished corner frame." "A beautiful early 20th century painting with very specific information regarding its' history." A beautiful scene, rendered with excellent, heavily textural brushwork. "One of the best renderings by the artist. The subject-matter is extraordinary." "An interesting piece of Southern genre folk art from the early 20th century." "A very beautiful painting of a subject very dear to lots of folks." "An exceptional watercolor painting by a listed mid-Western artist." "A beautiful winter scene by an accomplished American artist." "A very large and beautiful painting." "A very interesting naive Southern folk art rendering." A Regionalist watercolor evocative of Charles Burchfield. A painting of the American West rendered in the "Regionalist" genre. "A Beautiful Rendering in a Fauvist Style." "A beautiful and very early 20th century rendering by a well-listed American artist." A delightful rendering reminiscent of the Arts & Crafts Movement. A pleasing still-life painting by noted Nashville artist Cornelius Hankins. "An interesting American painting from the 1930's by an artist who was very active during the 1st half of the 20th century." "A superb etching by one of America's historically important printmakers." "An interesting early 20th century New York market scene reminiscent of the Ashcan School." "An interesting American genre painting with strong and brilliant opaque colors." Man Ray, a highly important American modernist, produced paintings, photographs, collages, sculpture, and avant-garde films. His creativity defines his artistic legacy. "A Very Pleasing Pair of Early 20th Century Arts and Crafts Paintings from the State of Washington." "A quality rendering by a talented artist." "A beautiful rendering by an accomplished American female artist." "A very rare early depression era depiction by an artist who exhibited at the 1939 New York Worlds Fair." A powerful example of Social Realism. "AT THE OPERA by Helen Farnsworth Sawyer, N. A. A riveting rendering of a hauntingly beautiful woman out for an evening's entertainment. A rural scene in the Regionalist genre. "A very interesting small work by a renowned African-American artist from Tennessee." "One of the Artist's Best Tonalist Renderings, with a Wonderful and Haunting Contrast Between Dark & Light." "A pleasing floral still life by a well-known early 20th century Tennessee artist." "An interesting painting with a Milledgeville, Georgia history by a Tennessee artist." "A familiar theme, especially in the past, in the Southern Appalachians." "ROBERT E. LEE (Copyrighted in 1870 by Bradley & Company) Engraved by A.B. WALKER after a photo from life. "Historically important engraving of Robert E. Lee." "One of Edmund Ashe's mountaineer studies for his celebrated renderings of people of the Southern Appalachian Mountains." "...the one powerful painter of the tragic lacks and losses." -- Edward Markham, Poet, quote from the early 20th century. "An interesting Chicago scene in the American Regionalist style." "An exceptional impressionist painting of a snow scene in early 20th century New York City." An exceptional work by a noted New York artist. One of the artist's finest works. A large canvas in pristine condition. "An extraordinary exhibition piece by Baum in excellent condition which arguably is one of his best renderings." "A very rare and highly collectible painting by a Southern African-American artist." "A very colorful and interesting 19th century folk art painting in excellent condition of a scene in Ohio with the original hand-decorated frame." "FREE MASON ST., NORFOLK, VA" by Robert Barritt Verso: "Painted Feb. 4, 1935"
A very interesting American Regionalist painting with a Southern subject-matter. "The pictorial arts flourished in Charleston under the influence of two visitors, Gabrielle Clements and Ellen Day Hale." A fine example by a very prominent American artist. Wonderful brushwork and a rich palette. "A very good rendering by one of America's very important late 19th and early 20th century artists." "A very charming rendering by Gilbert Gaul that is fresh to the market." "One of the artist's best renderings and in the manner of Edward Hopper." "A very interesting painting from the 1930's by an American Artist who exhibited in the prestigious 1939 New York World's Fair." Painted in Boulder, Colorado in 1945. "An Evocative Southern Scene by a Very Important American Artist." "Very Rare Southern Tennessee Valley Authority Mural Study." "Very Rare Southern Mural Study for the Tennessee Valley Authority." "An extraordinary Nostalgic Southern Painting with Historic Significance." "A very rare early 20th century fine art etching of Nashville, Tennessee." "A superb Rendering by Anthony Thieme of a Beautiful and Fantasful, but real, Southern Doorway." "An interest piece by a Southern "New Deal" artist." "One of the artist's best renderings." "A Superb Genre Rendering by Gilbert Gaul." Probably the artist's best rendering." A lovely woman, sitting on a park bench, wearing traditional Spanish garb. A striking modernist landscape reminiscent of Rockwell Kent. Painting exhibited: Ferargil Galleries, New York, ca. 1930. "One of artist's better renderings of one of his favorite subjects. William Aiken Walker is an iconic artist of late 19th and early 20th century Southern genre art." A nostalgic scene depicting a bustling city street. Josephine Baker (1906 “ 1975) was a Parisian dancer and singer, the most famous American expatriate in France. This is a powerful stylized rendering of the famous entertainer. A nostalgic interior scene of a luncheonette from a unique perspective. Desirable subject matter, by a well known Cape Anne school painter. "A rendering by a Nashville woman known internationally for her needlework and quilting patterns, and whose publications are still being used. Mrs. Orr, a Nashville socialite in the late 19th century and early 20th century, was a woman "...who shaped the second wave of the Appalachian handicraft revival...."
"A superbly rendered work, one of the artist's best." A very interesting Southern scene which was probably rendered during the time he lived in Tennessee. A very charming naÃ¯ve painting in an original gilt frame. A quality rendering by the artist. An unusual naÃ¯ve painting in a period hand-painted frame. Charming naÃ¯ve painting of two cows wading in a clear country stream. "OLD COUNTRY ROAD, NEW JERSEY" by Richard Hayley Lever, N.A. Beautiful brushwork, with heavy impasto. A view of the gardens at the famed Nashville estate. Called "Cheekwood," the house was built by Leslie Cheek, Sr. (of the Maxwell House coffee fortune). The mansion and gardens were eventually turned into a museum. A pastoral scene rendered with dream-like nostalgia. "A very rare subject by an important Tennessee artist." An introspective painting of a Tennessee stream. An Important Mid-century Modern Painting by a Listed American Artist. A pleasing & well painted harbor scene. A small very well rendered painting attributed to an artist who was an important exponent of the Hudson River School. The variant "blue night linoleum block exemplifies the artists' mastery of color prints representing night scenes. An interesting piece by a noted political cartoonist. Wonderfully sentimental 19th Century painting - very desirable subject matter. A rare "New Deal" Colorado landscape by a noted Tennessee painter. A very desireable Southern scene. A very interesting street scene with a war bonds poster, advertising signs, smokestacks, phone poles, lone figure, etc. Scene was most likely rendered off Hillsboro Pike in Nashville, TN. A nostalgic Nashville scene with great local appeal. A painterly rendering of New Hampshire's beautiful White Mountains at dawn. A highly important work relating to the American Civil War with tremendous historical significance. An eastern United States version of American Scene painting or Regionalism. An extraordinarily well rendered impressionist Southern scene in a vibrant, pleasing palette. A small gem of a painting by the well-known Kentucky artist. A Regionalist painting depicting a table laden with a bountiful harvest. An early, very well painted work by the artist depicting a rural winter scene. A glimpse of life in rural Appalachia during the 1920's. Appears to be a Federal encampment with the overall image probably taken from Pinnacle Overlook. Riveting subject matter, presented in a very painterly way. These portraits are the work of an itinerant Southern artist. 19 pieces attributed to the same hand are currently in the collection of the Museum of Southern Decorative Arts (MESDA).